This recipe is aimed at toddlers and children or may be shared with the whole family. Ideal recipe when little ones are independently feeding themselves, and for introducing different flavours and textures to their food. These recipes are also great for batch baking and freezing! These little delights are a nice treat for the whole family to enjoy. They are easy to store and are full of fresh fruit! Dish: 2 x medium mixing bowl, 8 x 8 cm (3 inch) ramekins Have a look at our new convection, grill & combination cooking 27L microwave superstar, the NN-CD58JS. Make the crumble topping by rubbing the butter into the flour until it resembles fine breadcrumbs. Mix the golden caster sugar, salt and oats into the crumble topping. 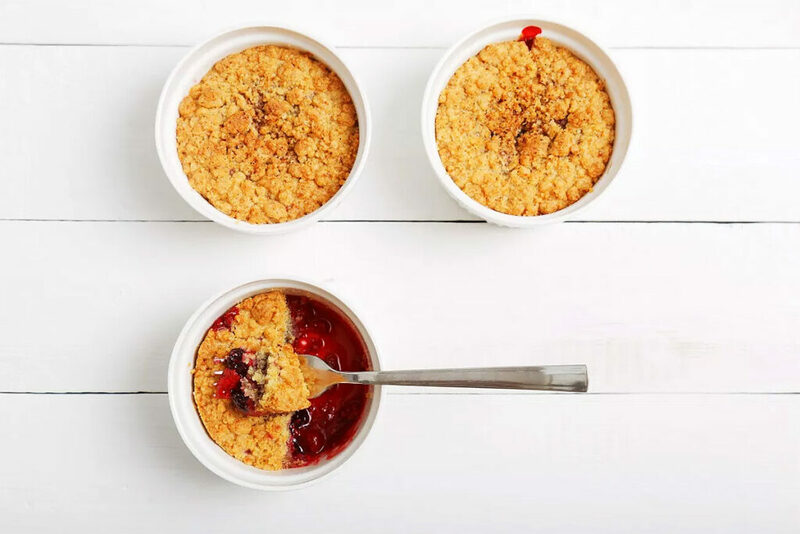 Mix the apple, pear and raspberries with the caster sugar and divide equally between the ramekin dishes and top with the crumble mixture. Place the ramekins onto the enamel tray and cook on Combination: 180 ºC + Simmer power for 15-20 minutes.